mitmproxy is your swiss-army knife for debugging, testing, privacy measurements, and penetration testing. It can be used to intercept, inspect, modify and replay web traffic such as HTTP/1, HTTP/2, WebSockets, or any other SSL/TLS-protected protocols. You can prettify and decode a variety of message types ranging from HTML to Protobuf, intercept specific messages on-the-fly, modify them before they reach their destination, and replay them to a client or server later on. Use mitmproxy's main features in a graphical interface with mitmweb. Do you like Chrome's DevTools? mitmweb gives you a similar experience for any other application or device, plus additional features such as request interception and replay. Write powerful addons and script mitmproxy with mitmdump. The scripting API offers full control over mitmproxy and makes it possible to automatically modify messages, redirect traffic, visualize messages, or implement custom commands. 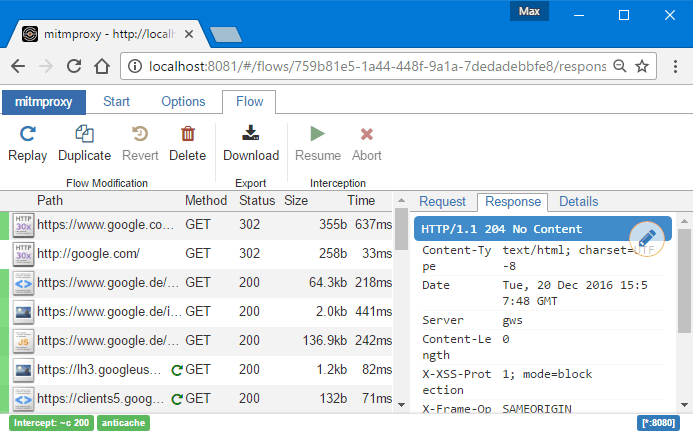 pathod, mitmproxy's sister project to craft malformed HTTP/1, HTTP/2 and WebSocket requests. netograph, a privacy analysis and measurement service. 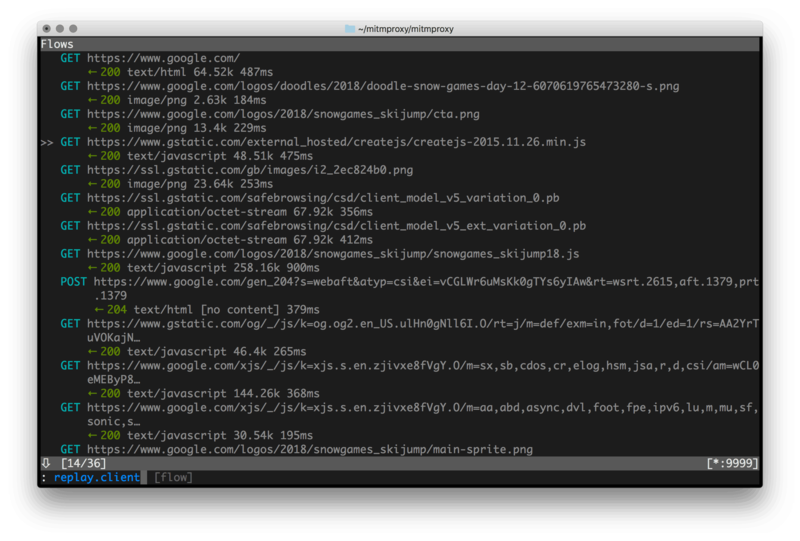 tamper, a Chrome extension that lets you edit remote files locally. bdfproxy, a BackDoorFactory integration to patch binaries with shell code on the fly. Mitmproxy is free and open source. Be part of the mitmproxy community and help improve your favorite HTTPS proxy. mitmproxy, a project by @cortesi, @maximilianhils, and @raumfresser. Maintained by the core team with the help of our fantastic contributors. Code licensed MIT, website © 2018 Mitmproxy Project.